I have been wanting to take another shot at another eggless cake for a while now. My housekeeper is a pure vegetarian, and whenever I bake, she takes stuff back home for her kids (they eat eggs and meat) but she never gets to eat some herself. So I was looking for a simple recipe that would give me a chance to share some cake with with her. Then I discovered Poornima and her delicious blog, and found the most wonderful eggless cake recipe. What’s better, it called for wheat flour and jaggery! Jaggery is kind of like molasses, except that it is lighter brown, rather golden syrupy in colour. Basically, sugarcane juice is boiled down for hours and hours till you get a viscous liquid and when this hardens, you get jaggery. (Source.) Jaggery is used widely in Indian cuisine, and in Kerala, where I come from, it is used to make all kinds of sweets and payasam. I’ll put up a detailed post on payasam later. Rather strapped for time now. Anyway, I tweaked the recipe by adding some black sesame seeds to it…Ellunda or jaggery-sesame balls, which are eaten in every corner of Kerala, taste pretty great, so I figured that the combo would work in cake too. 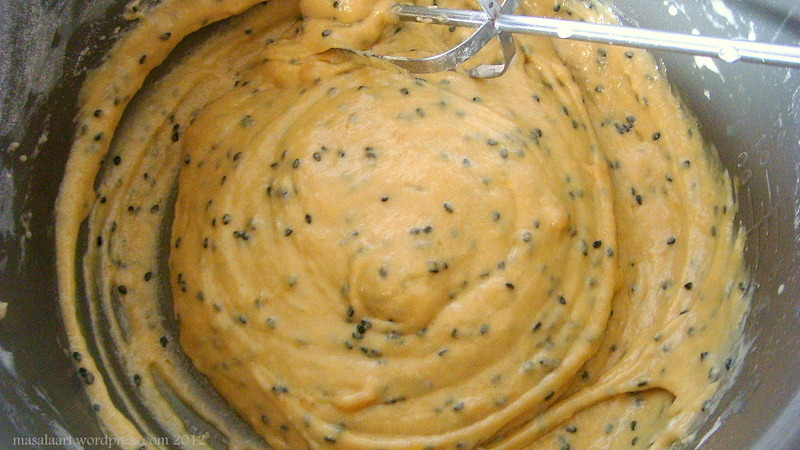 Lemon and poppy seed in the West, jaggery and sesame in Kerala! Preheat oven to 180 C and grease a baking dish or loaf pan and keep aside. Sieve together the wheat flour, all purpose flour, baking powder and baking soda in a large bowl. Add in the black sesame seeds and swish them around. Add the grated jaggery and mix gently. Add the milk, oil and vanilla extract and mix well with a spatula or wooden spoon. Pour batter into a greased baking dish or loaf pan and bake for 30-40 minutes at 180 C or until a toothpick or knife inserted comes out clean. I was skeptical because the last time I tried something eggless it was less than perfect, but this cake was a winner. My husband ate one-fourth of the loaf as soon as he got back from work and he is not too big on sweet stuff. 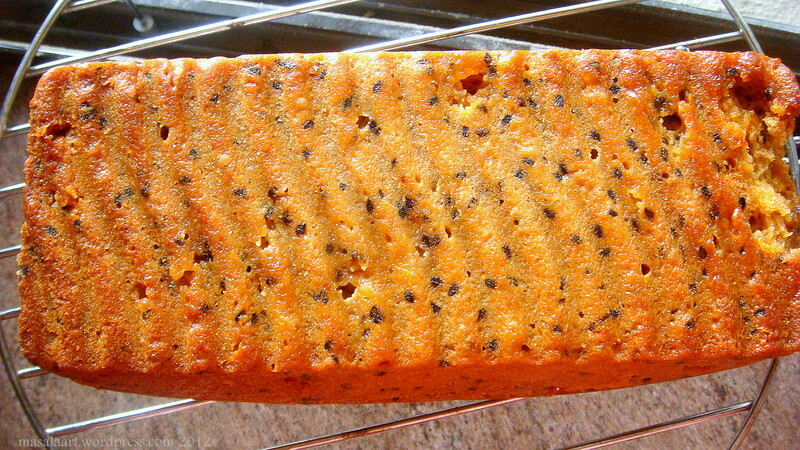 It’s got a great consistency- not too crumbly, not too chewy, a little sticky…and the colour!! Oh it is beautiful. It’s because of the jaggery no doubt. And the sesame seeds just make it more fun! So now I am off to celebrate my son’s first birthday. When he turns 2, I will be seeking the advice of Ameena, who sure knows how to throw a phancy birthday party. « With Love From Me To You: blog awards, en masse. This is so cool! Jaggery + sesame in a cake? Just lovely. Oh I feel like I’ve just had a celebrity visit my blog!! So exciting. Yeah, I had only used jaggery for chutneys and stuff before, but this looked interesting. It came out quite nicely. Thanks so much for stopping by!! I am thrilled. Thanks Deepthi. So far, I had also used jaggery solely for chutneys and curries and the like. It works well though! I have a gluten free friend who was reading this post over my shoulder and she did laugh at your comment telling her to “run”. This looks like a kinda heavy cake to me, but I love the colours you showed us in the pictures. You’re pointing me in the direction of some very new ways of cooking – ingredients, tastes and textures – fascinating! That looks great. I’m going to have to make a stop at an Indian market to see if I can find some jaggery. Oh you should see if you can get your hands on some- it can be used in all kinds of curries and vegetables and chutneys! Happy Happy Birthday to your little one! I’m sure you need no tips from me on how to through a fantastic party! LOL! Thanks much. I know it’s quite fun when you discover or learn about something completely new. I love it when that happens. 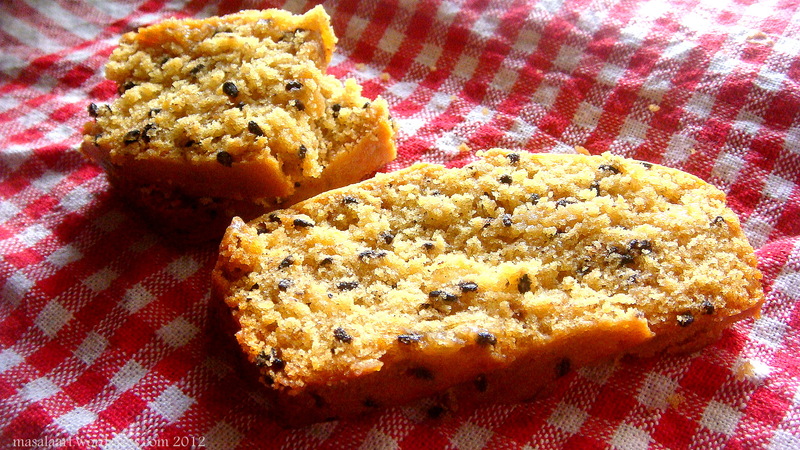 This looks great, and I like your addition of black sesame seeds, perfect with a cup of tea! Thanks Anita 😀 I used to eat lumps of jaggery at my grandmom’s house when I was little. It can get pretty addictive!! I read a recipe on the Patterned Plate with jaggery a week or two ago and I was salivating. I’m sure I could find it in a more ethnically diverse city, but it’s not available out here in Nowheresville. So for now I will just have to enjoy your photos. Happy Birthday to the baby! Thanks Heather! I’m sure you could substitute this with molasses. I am still not sure what the real difference is, because I have not been able to get my hands on molasses in my part of the world either!